The Indegenous People of Biafra (IPOB) has warned the Ohaneze Ndigbo leader Chief John Nnia Nwodo to steer clear of its activities or have himself to blame. The group accused the leader of the Igbo apex organisation of misleading the world by tagging it a militant organization, insisting that he, Nwodo, is the only person carrying out such propaganda. 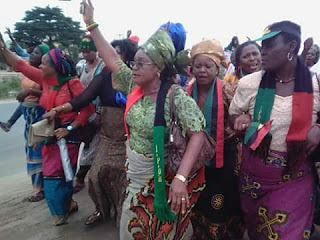 The statement partly read, “We have read with shock and disappointment the unedifying utterances of Chief John Nnia Nwodo to the effect that the noble global family of IPOB is an organisation involved in fighting other interest groups within Igboland and Biafra, thereby giving the misleading impression that we are a militant organization of sorts. Nothing could be further from the truth. “Nwodo’s unfortunate statement is clearly in furtherance of a well rehearsed line designed by enemies of Biafra to convey an erroneous impression about our activities thereby stubbornly driving the agenda of the National Security Council (NSA), Monguno, the DSS D.G, Lawal Daura, Gen. Tukur Buratai And Gov. Dave Umahi against IPOB. “These are the people that brought about the murderous Operation Python Dance six months ago, to kill and maim unnamed agitators. Now as then, it was Nnia Nwodo, Dave Umahi and Okezie Ikpeazu that went to great length to falsely paint IPOB a violent group. “Six months later and without any remorse for the hundreds murdered in cold blood as a result of their greed, envy and jealousy, Nwodo is stubbornly struggling to sustain the false propaganda he initiated at the behest of his Hausa Fulani masters. “It is a shame that the only person screaming to the world that IPOB are fighters that insult and attack at any given opportunity is this same Nnia Nwodo. We can only deduce from his actions that he is desperately committed to financially lucrative deal with Buratai and Lawal Daura having collected huge sums of money to engineer the largest military invasion with lethal intent, since after the war in 1970 in Operation Python Dance II. “We IPOB have never attacked any one, except our well established acts of civil disobedience during public gatherings. We don’t drive around with R.P.Gs and AK 47s, yet Nwodo continues to struggle to tag us with the bagde of militancy. “The only public meeting of Ohaneze Ndigbo Nnia Nwodo has ever called in nearly two years of his stewardship was at Nike Lake Resort Enugu to endorse the proscription of IPOB less that 24 hours after the army invaded the home of our leader Mazi Nnamdi Kanu and killed 28 people on September 14, 2017. “It is on record that at the said gathering in Enugu Nnia Nwodo on behalf of the presidency of Buhari distributed money to Igbo traditional rulers and clergy who gladly accepted a handout of Five Hundred Thousand Naira each (500,000) each to betray Nnamdi Kanu and IPOB agitation”. Evidence abound that this was what transpired. “The likes of Anglican Emeritus Archbishop Anikwenwa from Awka was at the meeting and can confirm this. Most Igbo traditional rulers that attended the gathering collected their share of this blood money from Aso Rock. If not for the very vocal objection of a few senior clergymen like Archbishop Anikwenwa the resolution calling for the public condemnation of Nnamdi Kanu, barely 24 hours after his home was stormed by soldiers, could have been carried. Nnia Nwodo has since sidelined his Secretary-General Barrister Uche Okwukwu and operates a one man show, waiting for an appointment from Buhari . “Nnia Nwodo is the person always attacking IPOB at every given opportunity. He did so at Anambra State House of Assembly; he later gave a press conference on why he parted ways with IPOB, claiming we want to start a war. Now he is going about giving lectures, saying we are fighters. The entire world stand as witness between us and Nnia Nwodo as he is consistently twisting the tiger’s tail in an attempt to wake it up from sleep. “We must emphasize that we are in very good terms with well known and respected Igbo leaders. The number one public enemy today in Biafraland is Nnia NWODO. He has sold his soul to the devil for a pot of porridge. He is digging his own grave and those of his children, whose addresses in the U.S. are in our possession. He is dancing to the rhythm scripted by his maters, Buratai, Monguno and Lawal Daura. Those who know him should please tell him to steer clear of IPOB because those the gods want to destroy, they first make mad. We dare him to try us by convening a public meeting anywhere on Biafran soil.